The dust mite gathers where there is warmth, moisture, and a good supply of their food, skin flakes. This makes the average mattress an absolutely perfect environment for them to live and breed in. At Mum’s Helping Hands we provide a mattress cleaning service, in order to remove what could be anything between 100,000 and 10 million mites from your mattress. Upholstery and Carpets can be a similar haven for mites, so we can provide a thorough cleaning of upholstered furniture and carpets to further help you in the battle against dust mites. If you are one of the many people in the UK who are allergic to them (including 85% of all asthma sufferers), then this could save you countless hours of lost sleep caused by the discomfort of your allergic reaction. 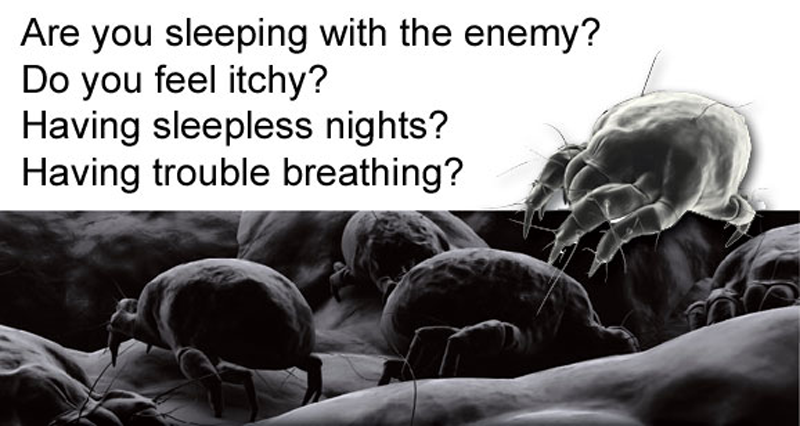 If a persistent blocked up nose, irritated eyes, irritated skin, or worsened asthma and eczema symptoms are a familiar problem to you at night, then you may be one of these unfortunate sufferers, and lowering your dust mite population can be an effective way of reducing these symptoms. A study by the David Hide Asthma and Allergy Research Centre found that pregnant women living in a reduced dust mite environment were less likely to give birth to babies with dust mite sensitivity or with asthma. We also offer this service to hotels and nurseries to create allergy friendly nurseries and hotel rooms around the country, meaning travelling with allergies isn’t a problem any more. Our Mattress Cleaning Service is for the reduction of dust mites, odour removal, and sanitisation and hygiene purposes, and so we therefore cannot guarantee the removal of stains. The allergic reaction isn’t caused by dust mites themselves, but by their faecal pellets. Over 200 times its body weight of these are produced in each individual mite’s lifetime. These particles then float up and can be breathed into our lungs and throats, and this is where the problems start for some people. Symptoms last all year round and are sometimes worse in the winter due to closed windows causing less ventilation. Our mattress cleaning service is certified by Allergy UK so it can help relieve dust mite allergies along with asthma and eczema. It’s also fantastic at removing bad lingering odours that can be near impossible to get rid of otherwise. Older mattresses often don’t comply with newer fire regulations, so we offer a Fireproofing Service to potentially reduce fire damage in houses, and help make sure that regulations are met.